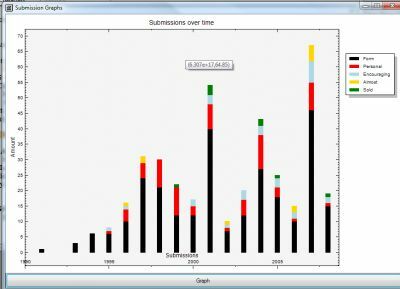 This utility lets you analyze your submissions in a graphical manner. Just press the Graph button after loading it. It uses the Nplot graphing library. Download both [download#3#nohits] and the appropriate add-on based on the version of YourOtherMind you have running. Go to Help|About in YourOtherMind to determine your version. Once downloaded copy both files to your install (see below for more install details).